BRINGING THE MUSIC OF KRONOS QUARTET TO LIFE: LIVE CONCERT DOCUMENTARY A THOUSAND THOUGHTS TO SCREEN TWICE DURING 2018 HOUSTON CINEMA ARTS FESTIVAL INTIMATE PERFORMANCES AT ASIA SOCIETY TEXAS CENTER ON SUNDAY, NOVEMBER 11 SET TO BE HIGHLIGHTS OF HCAF18 HOUSTON, TX –– The 2018 Houston Cinema Arts Festival – which celebrates its 10th anniversary – has announced its first piece of programming in the form of two scintillating performances of the live documentary A Thousand Thoughts on Sunday, November 11 at Asia Society Texas Center. The live concert screening exhibitions will be held at 4 p.m. and 7 p.m. During each of the two limited-seating performances, Kronos Quartet – a celebrated and groundbreaking string quartet from San Francisco, CA comprised of David Harrington (violin), John Sherba (violin), Hank Dutt (viola), and Sunny Yang (cello) – will perform live in concert alongside the presentation of the film A Thousand Thoughts. Yang – who was born in Incheon, South Korea – joined the group in 2013 as its fifth cellist. Written and directed by Oscar-nominated filmmakers Sam Green and Joe Bini, the film is a wide-ranging documentary about the quartet and its 40-year history of acclaimed performances featuring interviews from notable artists such as Philip Glass, Tanya Tagaq, Steve Reich, Wu Man, and Terry Riley. Together on stage during the course of the film, Green and Kronos Quartet interact effortlessly with the narrative transpiring on the screen in order to take the audience on an immersive musical journey. The live documentary experience has thus far held only seven performances – including at the 2018 Sundance Film Festival – dazzling audiences at every turn. “As it celebrates a major milestone this year, the Houston Cinema Arts Festival is delighted to offer audiences the chance to experience A Thousand Thoughts in an intimate setting at the Asia Society Texas Center,” commented HCAS Artistic Director Richard Herskowitz. He added, “Asia Society offers the perfect vehicle for this interactive live screening event. 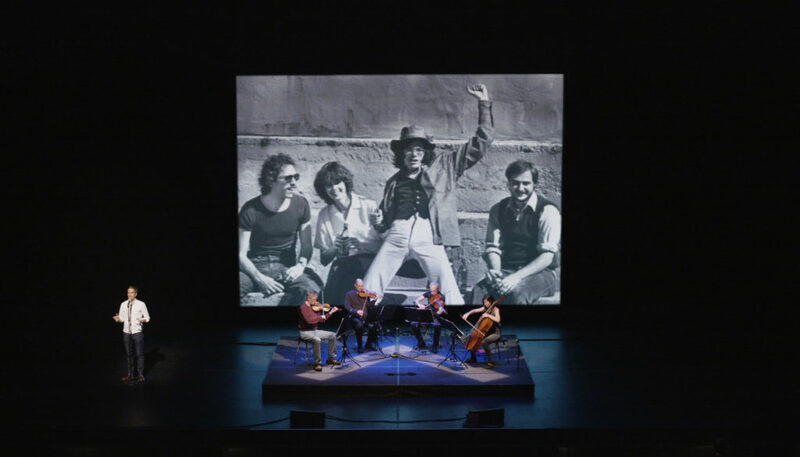 Guests will feel like Kronos Quartet is in their own living rooms for 85 minutes.” A Thousand Thoughts filmmaker Sam Green will be one of the many returning guest artists who have made their collective marks upon Houston Cinema Arts Festivals past. Part of the mission of HCAF18 will be bringing HCAF alumni back to Houston in November and celebrating their artistic achievements over the course of the festival’s five days. Tickets for the two showings of A Thousand Thoughts are now on sale. Tickets may be purchased by visiting cinemahtx.org. Houston Cinema Arts Society (HCAS) is a 501 (c) (3) nonprofit organization dedicated to presenting innovative films, media installations, and performances that celebrate the artistic process and enrich Houston’s culture and urban vitality. Created in 2008 with the support of former Houston Mayor Bill White and philanthropist Franci Neely, it organizes and hosts the annual Houston Cinema Arts Festival, a groundbreaking and innovative festival featuring films and new media by and about artists in the visual, performing, and literary arts. The Festival celebrates the diversity of the arts in Houston and elevates the city’s film and arts scene. Houston Cinema Arts Society sponsors include premiere sponsors Houston First Corporation and Anadarko Petroleum Corporation, signature sponsor Levantine Films, and featured sponsor Nabors Industries. HCAS is also supported by the Franci Neely Foundation; The Petrello Family Foundation; Amegy Bank; Kinder Foundation; Brown Foundation, Silver Eagle; Texas Film Commission; Houston Film Commission; Texas Commission for the Arts; National Endowment for the Arts; and Houston Arts Alliance. The 2018 Houston Cinema Arts Festival will take place from November 8-12, 2018.